Plenty of parking behind the restaurant or in the parking structure across the street. 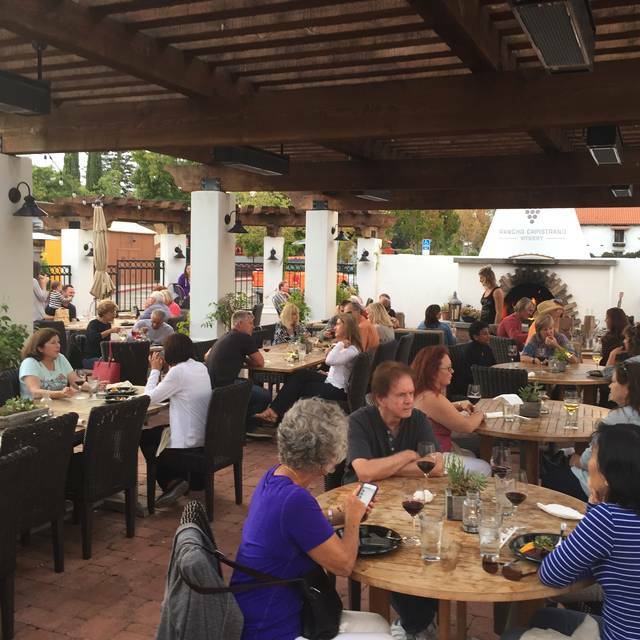 Winner of 17 Best of San Juan Awards including best restaurant, best dinner, best lunch, best ambiance, best wine and many more. 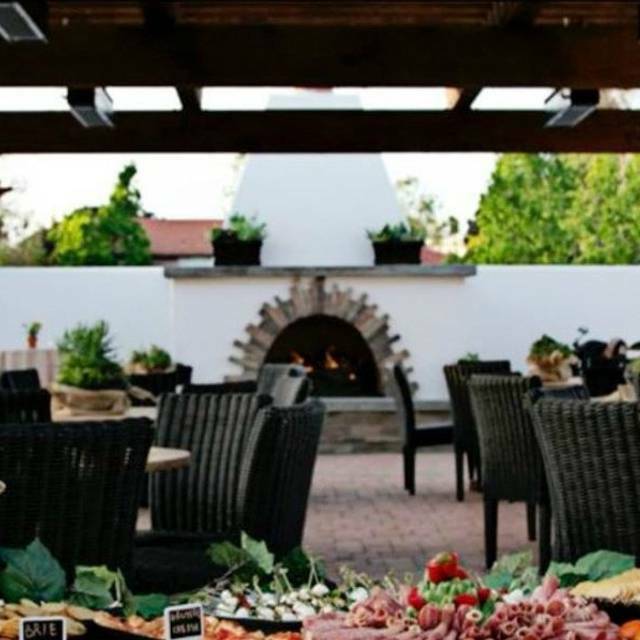 Rancho Capistrano Winery has become the must go destination for locals and visitors alike. The winery offers over 30 different house made wines created from grapes from some of the worlds finest wine growing regions. A generous portion of selected cheeses with fresh seasonal fruit, dried fruit, nuts, and crackers. Traditional hummus, Sun Dried Tomato, and spicy Baba Ghanoush served with toasted Pita. 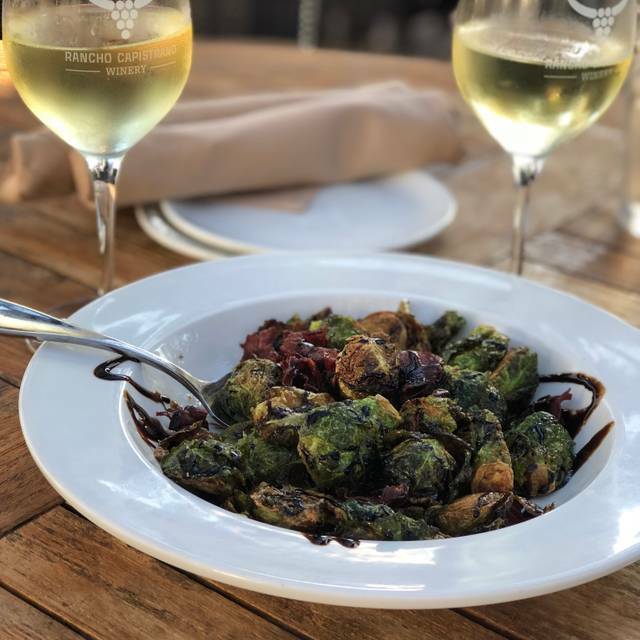 Our famous Brussel Sprouts with Prosciutto, garlic, Parmesan, lemon juice, and Balsamic reduction. Marinated fresh Strawberry Roma Tomato mix atop a crostini. Finished with goat cheese, chiffonade basil, and balsamic glaze. 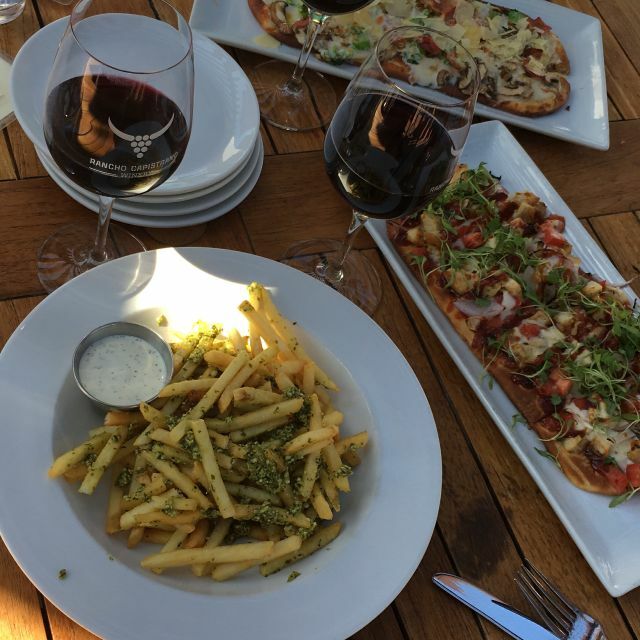 Your choice of Sweet Potato Fries, Classic French Fires, Cilantro Pesto Fries, or Lemon Truffle Fries. A sweet soy glaze topped with seasonal vegetables and mozzarella cheese. Chopped White Shrimp cured in lime juice. Mixed with tomatoes, jalapenos, red onion, and cilantro. Served with house made Tortilla Chips. Alfredo sauce topped with Crimini mushrooms, Prosciutto, Broccolini, Truffle oil, Mozzarella, and Parmesan cheese. A pair of lightly beer battered Cod tacos served with an Asian aioli, Asian slaw, and topped with an avocado and cilantro. Seared Ahi atop a bed of mixed greens, green apples, sliced oranges, minced shallots, strawberries and cucumbers. Tossed in a champagne vinaigrette. Charred romaine lettuce with house made dressing. Served wit lemon herb marinaded chicken. Baby kale tossed with blueberry & raspberry vinaigrette served with goat cheese, pecans, fresh berries and dried fruit. Strawberries, red onions, green apples and cucumber served with mixed greens and a lemon herb vinaigrette dressing. Served with your choice of sweet potato fries, quinoa salad, potato salad, or a side salad. Grilled portabello mushroom featuring goat cheese, strawberries, mixed greens and finished with balsamic glaze. Grilled chicken, sliced tomatos, baby arugula, and basil topped with pesto and basaltic reduction sauce. Sundried tomato, bail, zucchini, pepper, eggplant, onion, with a goat cheese spread. 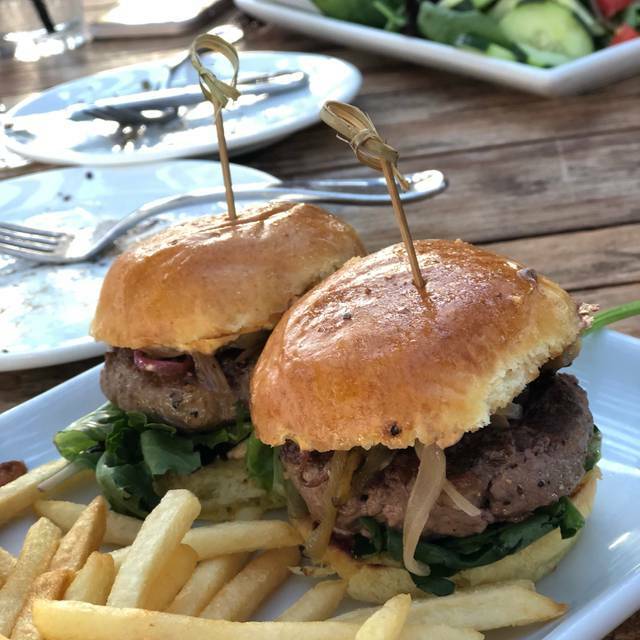 Two lamb sliders topped with goat cheese aioli, mixed greens, grilled onions roasted red peppers, and honey mustard. Grilled and baked portobello topped with marinara, mozzarella and parmesan. Served with wild rice and sautèed vegetables. Linguini with sun dried tomato, and artichoke. Served with grilled chicken and a creamy pesto sauce. 8 oz. grilled salmon with marinated tamarind glaze. Saute'd vegetables and Minnesota wild rice. Mozzarella, fresh basil and home made sauce. Pepperoni, Salami, and ground Italian meats, and mozzarella. Artichokes, prosciutto, Goat Cheese, and mozzarella. Prosciutto, Goat Cheese, Roasted Veggies, Basil, & Balsamic Glaze. Prosciutto, Red Pepper Flakes, and Fresh Pineapple. Pepperoni and cheese with house marinara. Simple cheese pizza with house marinara and mozzarella. Kid size cheese pizza with choice of a single topping. Coke, Diet Coke, Dr. Pepper, Diet Dr. Pepper and Sprite. Un-sweetened passion fruit iced tea. Served by the 12oz bottle. A great Indian pale ale. Hop-forward yet civilized. A crisp and clean malt flavor similar to a pilsner. Pilsner and wheat malts spiced with Coriander and orange peel. Straight-forward dry hopped California pale ale. Live music at lunchtime so loud that you could not have a conversation. Three requests to turn it down were ignored. Will not return. We have eaten here several times before, the food and wine is fantastic! Unfortunately the service was beyond terrible. At 40 min we had no food and they had not taken our meal order. The apps we ordered went to another table. The server knew it was going south but for some reason had no help. The manager was no where to be seen and the food runners didn't understand the table numbers. So sad :( We will wait for new management or a change in the service to go back. We didn’t order wine and came for a healthy lunch. The patio was nice and it was moderately busy. Everyone seemed to enjoy the food but ours was just not that great for the money. We went with our family from out of town for a birthday. I had written this in both my reservation on opentable and we told the restaurant upon arrival. The waitress did not acknowledge this. We had asked about the beers and she didn’t know what kinds they had at the time. We ordered an appetizer that came out with the food. Additionally, when we asked for certain requests (another drink or condiments) she would forget and we had to go to the counter inside to request again. I don’t think we would go back to this restaurant as it seemed disorganized and unwelcoming. We love Rancho Capistrano Winery. The food and wine incredible, the service is fantastic, and the ambience is fun and romantic. Highly recommend!! The chicken vegetable soup was delicious! When I asked the hostess about a catered event, she handed me a piece of ripped paper with a name and phone number of their event coordinator to call. No business card? Hmmmm? Next time leave some for interested parties! We ate on the patio before anyone else showed up. I had to ask to turn down the Country Western music. The table was under a heater so that was fine. The service could have been better given low occupancy while we were there, water refills, removing used dishes, ordering. My meal of the BLAT with tomato soup was good. Great food and service ! Look forward to a return visit soon ! Our waitress Kyra was great! 10/10 all around. We love being members here!!!! atmosphere and people who work there are great! Booked lunch after our Amtrak train was to arrive at the nearby train station. The patio was lovely, and had a large fireplace with a roaring fire. So inviting on a crisp day. We've lived in the area a couple of years and always loved the vibe walking by so we had to try. Wine choices are excellent and the charcuterie board is one of the BEST around! 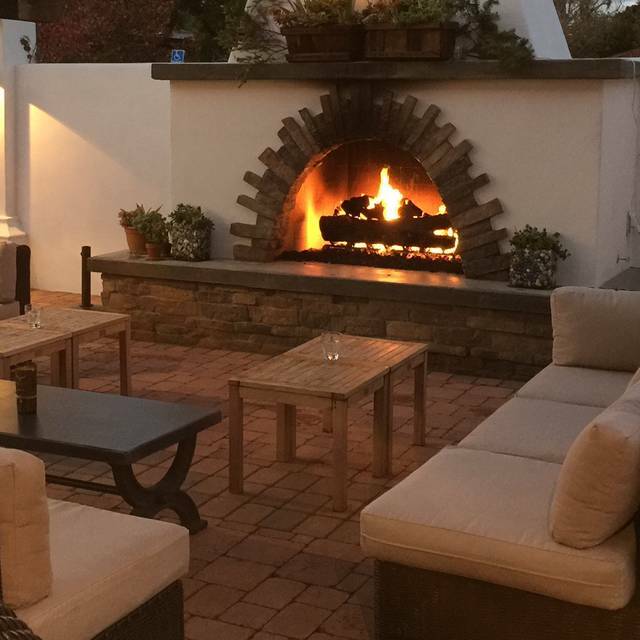 Great place to unwind, drink wine by the huge fireplace and relax after a long week. Recommend fried Brussels Sprouts, Big Cheese plate Estate GSM & the Mexican coffee port!! I took my husband here for a birthday lunch before heading to Dana Point for the night. The patio is beautiful and we really enjoyed the food and wine. Great service. Definitely will be making a trip to Rancho Capistrano Winery again. We went for a Saturday day morning brunch. The food was fantastic. We had the french toast bites as an appetizer and mimosa flights as starters. The patio had a perfect ambiance. We are planning to go back to try the dinner menu. Great atmosphere. Our server was friendly and knowledgeable. The lamb meatballs were delicious. Definitely heading back soon. I went there for the 1st time with 4 friends this weekend. It was outstanding! We were there for Sunday Brunch and loved the experience. There was a great live band playing outside and the food was great. Our table had waffles, Eggs Benedict, soup and fries! I would go back in a heartbeat and look forward to my next trip there. The food is consistently very good, attractively served. Good wait staff. Really nice atmosphere. 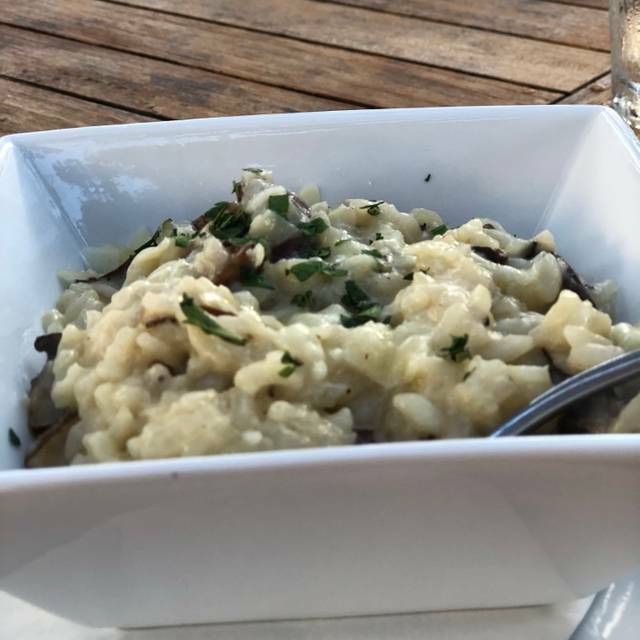 First visit to this restaurant with friends and was enjoyed by all! Lovely outdoor setting. I just wish they had a full bar. I found my new favorite Chardonnay!!! The Brussels sprouts app is to die for. I’ll definitely be coming back a lot!! We have always enjoyed the restaurant. Sometimes we bring our dogs and they enjoy all the attention too. always consistent!!! Great environment and awesome wine! The food was very good but the wine was not and the wine was expensive! We love Rancho Cap!! Food is always on point and so is the service. Very good food. The salmon was outstanding. Will definitely return. The pork chop cooked sous vide style is amazing and perfect to share! We got sat outside, it was freezing, the girl was irritaed when I requested a heater she said they was all in use. I asked to sit inside which they did. ordered appetizer which they forgot to bring, my pizza had some weird sauce on it, the wine was 30 dollars a glass. Wonderful lunch on the patio, close to the train station & historic district. Our salads were well prepared. On weekend evenings, various musicians perform. I made the reservation for me and my 5 friends. We got there are they had no record of the reservation. The girl made me look really bad like I didn't make the reservation when they had plenty of open tables. I showed her my confirmation and told me i had the wrong date when the date was correct and she sat us without saying a word after that. An apology woyld have been nice?? We booked New Years Eve at the winery via Open Table. When we got there they were closed . Two employees were doing inventory and said they closed at 3 pm. Either they didn’t inform Ooen Table or Open Table didn’t update the listing. Regardless , very disappointing on New Years Eve. We made a reservation for New Year's Eve dinner as OpenTable showed many tables available. Upon arriving at the restaurant, we were shocked to discover that it was closed and not open that day. It completely ruined our New Year's Eve plans and we were forced to scramble (as a large party of 6) to find somewhere else for dinner. Needless to say, our plans for a nice holiday meal were dashed; not to mention we had driven down from Los Angeles just to dine at the winery.